Back when I had my GBA, I really wanted the Nintendo Picross game, but it was really hard to find here in the states. I guess because of the wholly superficial resemblance to Sudoku, there are suddenly myriad versions of Picross available. I’m going to talk about and/or review two picross games: Picross DS for the Nintendo DS, and Gemsweeper for Windows PCs. 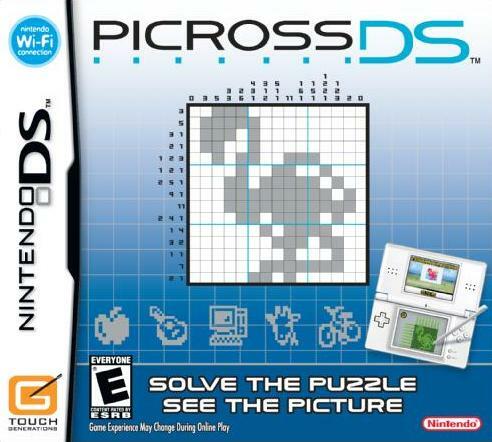 Picross DS is a straight-up Picross game. Thank you, Nintendo. Low low price of $19.99. I am not at all happy with the zoom scheme they came up with for the larger puzzles. It’s really hard to keep track of the big picture while you work, at least for me. So as you can see, the score is 7 to 2 in favor of the upsides. I’m a happy (addicted) camper. It made me stop playing Planet Puzzle League at least. At roughly the same time this game came out, I stumbled across another Picross game. First up, I’d love to include some kind of title screen or game logo here, but their product page doesn’t have one, just this screenshot and a picture of the game’s narrator. 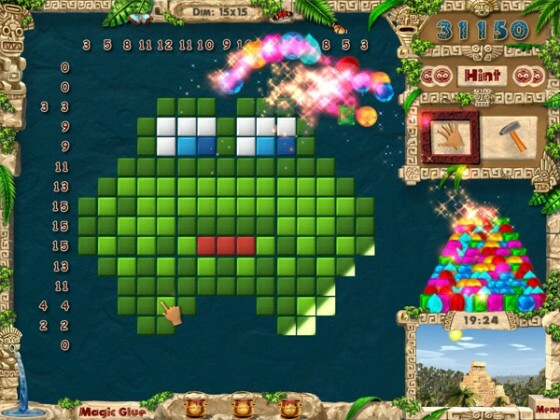 Gemsweeper plays on your Windows PC, so it has a great big screen and doesn’t need any kind of zoom-in mode for larger puzzles. There is a typical casual-games “Quest mode” which, like in most casual games, progresses in difficulty way too slowly. You can play through 5 “temples” of 10 levels each and even though the puzzles get much larger, they aren’t much more difficult. $19.95 – 4 cents cheaper than Picross DS! Two of the downsides aren’t really downsides as much as taste, so the score is 4 to 1 here in favor of the upsides. The biggest problem with these two simultaneous Picross games appearing in my life is that I am not getting a lot of work done. If Xbox Live Arcade released one now, I think I’d be paralyzed.